Join Leanne Lowe, Sage 100 ERP product expert, for this webcast to learn more about the Sage 100 ERP 2013 customer-requested enhancements as well as new cloud services and add-on solutions. See the new feature and functionality enhancements in Sage 100 ERP 2013 across the product in Accounts Payable, Accounts Receivable, Bank Reconciliation, Inventory Management, Paperless Office, Sage CRM, Intelligence Reporting, and Credit Card Processing through Sage Exchange. Sign up today and attend this one hour overview to learn how the new Sage 100 ERP 2013enhancements will benefit your business! With Sage CRM and Sage 100 ERP (formerly MAS 90 | 200), you can unify the sales and marketing aspects of your business. CRM supports the whole sales process — from your initial marketing campaign, lead and opportunity generation, quotes, to winning the sale, and finally, to fulfilling the order and providing outstanding customer service. Your marketing department will be able to justify the costs of their campaigns just as your salespeople will be able to track their forecasted sales. Plus, sales managers have a full view of their team’s productivity. Your staff will work more effectively because every aspect of your operations will be connected while your limited or expensive resources are optimized. Sage 100 ERP version 4.5 (formerly MAS 90 and 200) is here, and everything you’ve heard about the new features and benefits are all true and ready for you when you upgrade. In fact, there is so much for everyone that one hour isn’t enough time to cover all of the tremendous enhancements and inclusions, so we will be taking a broad look at the main points that everyone should know about, such as National Accounts for Account Receivable, integrated Customer Relationship Management, and the Reporting Tree capability for financial reports. We’ll also discuss the option to migrate to Sage 100 Premium ERP (SQL server). Session 3: Meet the next generation excel-based, financial reporting solution for Sage 100, 300, 500 ERP. BizNet’s award winning Excel® Business Information Suite is the most innovative and intuitive reporting solution on the market. It is a business reporting and analytics platform that provides real-time access to your business data from Microsoft Office Excel®. It delivers simple, yet powerful capabilities to anyone who uses spreadsheets to gather and analyze business information. With over 200 Partners, over 9 ISV’s, and Customers in over 14 different countries, BizNet has been selected as a top reporting solution by industry analysts. FINAL DAYS – expires 3/31/2102 – no extensions! 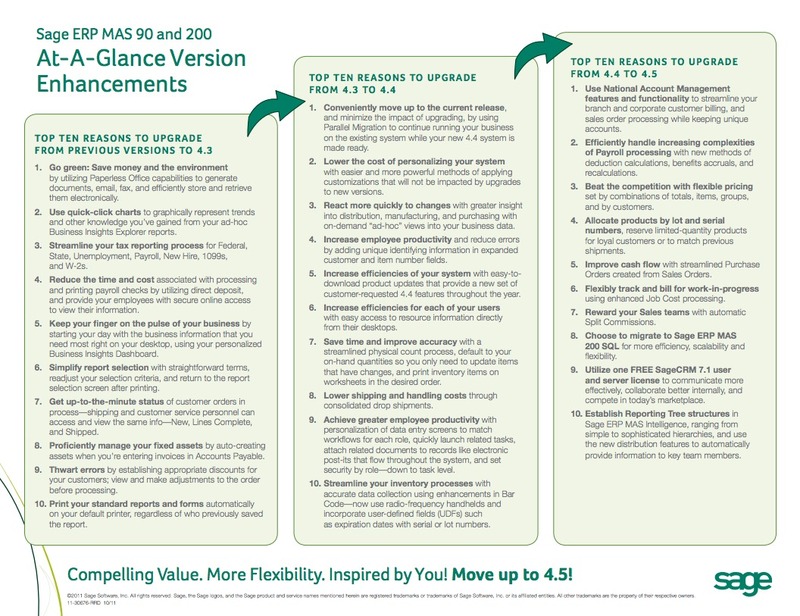 Sage ERP MAS 90 and 200 version 4.5 is here, and everything you’ve heard about the new features and benefits are all true and ready for you when you upgrade. In fact, there is so much for everyone that one hour isn’t enough time to cover all of the tremendous enhancements and inclusions, so we will be taking a broad look at the main points that everyone should know about, such as National Accounts for Account Receivable, integrated Customer Relationship Management, and the Reporting Tree capability for financial reports. We’ll also discuss the option to migrate to Sage ERP MAS 200 SQL. With Sage MAS 90 | 200 and Sage CRM, you can unify the sales and marketing aspects of your business. CRM supports the whole sales process — from your initial marketing campaign, lead and opportunity generation, quotes, to winning the sale, and finally, to fulfilling the order and providing outstanding customer service. Your marketing department will be able to justify the costs of their campaigns just as your salespeople will be able to track their forecasted sales. Plus, sales managers have a full view of their team’s productivity. Your staff will work more effectively because every aspect of your operations will be connected while your limited or expensive resources are optimized. 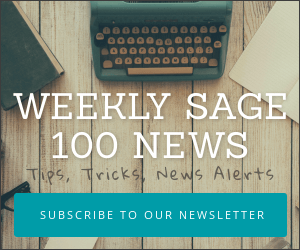 What Is New in Sage MAS 90 | 200 Version 4.5? Are you looking to enhance your reporting and analytics capabilities for Sage MAS 90 | 200, Sage MAS 500, or Sage Accpac? Meet the next generation excel-based reporting solution. Learn more about Sage ERP, CRM, and integrated business management software products through our free webinars and recorded, on-demand webcasts and demos. Discover Excel-Based Financial Reporting for Sage ERP!